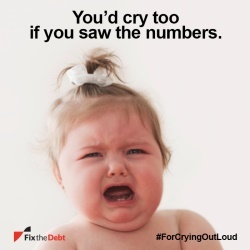 The Fix the Debt organization has launched a social-media-heavy initiative using crying babies to get the attention of Capitol Hill lawmakers. WASHINGTON: The Fix the Debt campaign has launched a cross-platform, guerrilla-style effort and social media blitz targeting legislators on Capitol Hill. The For Crying Out Loud initiative is an offshoot of the Fix the Debt effort, using images of crying babies in the hope of spurring action. Burson-Marsteller subsidiary Proof Integrated Communications has created the visuals for the effort. The campaign is pushing lawmakers to come up with a federal budget before the end of the government's fiscal year on September 30 and figure out a long-term solution to the country's $12 trillion debt, while at the same time not allowing the US to default. Fix the Debt is contacting more than 350,000 people who have signed petitions and asking them to send pictures of children, relatives, and friends with quotes about erasing the debt. The group is planning to share the images on social media with the hashtag #ForCryingOutLoud. Traditional and social media outreach will take place, and some grassroots activity is also planned. On the paid media side, the campaign will place images of the babies on bus shelters and within Washington's Metro mass-transit system, as well as on Facebook and Twitter. The ads direct viewers to text “cry” to an SMS short code to learn more about the campaign. “The point of this campaign is to draw attention to these issues though fun and creative images,” said Jon Romano, CCO of Fix the Debt. Using dramatic imagery also makes it more likely that the campaign will get noticed by its target audience, said Michael Bassik, CEO of Proof and chair of Burson's US digital practice. “To penetrate the media landscape in Washington, you have to be different and have to be creative; the same old Washington targeted advertising no longer works,” he added.